This past week emergency overnight borrowing at the ECB surged to record highs, and it was learned that it was Irish banks were at the trough. Ireland, after a period of calm, is clearly back at the fore, and big elections set for this Friday should mean that Ireland will dominate the news all week. The election is crucial since the opposition parties — which are likely to dominate — are not so keen on the IMF bailout/austerity deal agreed to by the current ruling Fianna Fail party. With a general election to be held on 25 February, there has been uncertainty on the likely winners’ intentions on renegotiating the EU/IMF packages and in particular on the possibility of haircuts to the debt of Irish banks. Based on current opinion polls, the main opposition party, Fine Gael looks set to overhaul the ruling Fianna Fail party and hold the balance of power, probably in coalition with the Labour party. Fine Gael and Fianna Fail are committed to the ongoing austerity measures, with nuanced differences (by contrast, Sinn Fein is opposed to IMF/EU austerity measures but, despite market worries, we believe it is unlikely to gain any influence). But Fine Gael has made it clear (as explained in its manifesto) that it wishes to renegotiate the terms of the loans from the IMF/EU. Among other things, it wants the European Financial Stability Fund (EFSF) to buy debt and equity in AIB and Bank of Ireland; it also wants the US regulators to allow it to secure funding of up to $50bn from the Federal Reserve using the dollar assets of Irish banks; and more interestingly it wants Ireland to be allowed to buy “insurance” from the EU against further losses in its banks. Without a renegotiation along these lines, Fine Gael has warned that it will unilaterally restructure the debt of Irish banks in greatest need of recapitalisation. The Labour party, a potential coalition partner, is also arguing for such haircuts (as well as for less aggressive austerity measures). In its most recent statements, Fine Gael’s rhetoric has been slightly more nuanced, saying it will impose losses only on senior bondholders as part of a Europe-wide framework. Even so, this uncertainty about what lies in wait after the general election has undermined confidence in the Irish banking sector. CDS spreads have remained elevated and Irish bank deposits have continued to flow out. December data showed that there was a €35bn (21%) month-on-month decline in non-resident deposits, which followed outflows of €20bn in November and €10bn in October. Irish resident deposits also declined by €5bn in December and €6bn in November. To boot, the explicit discussions on senior defaults by the government and opposition statements led Moody’s and Fitch to cut the rating of unguaranteed senior unsecured bank debt in the last two weeks, reducing further the ECB eligible collateral of Irish banks. The analysts also take a look at the matter of haircuts, and one powerful point they make is that ultimately haircuts for bond holders would have little impact on the sovereign’s overall debt sustainability (conspiracy theorists might note that OF COURSE someone writing from a bank would be a opposted to haircuts). There would be no significant gains in terms of debt sustainability. As we argued, the amount of outstanding unsecured senior debt in unviable institutions is small. 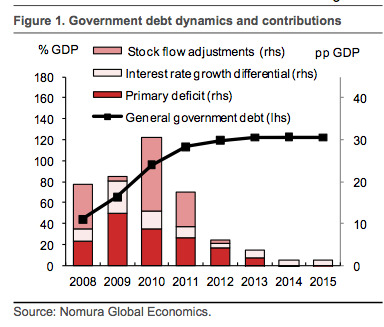 The debt reductioneven with a 40% haircut would not bring any considerable gains in terms of debt sustainability. 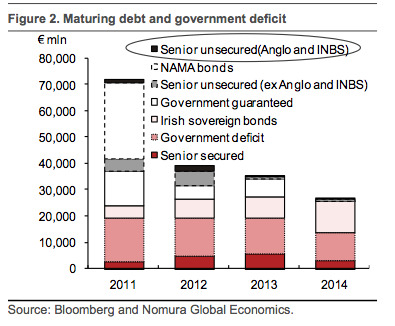 We project the debt dynamics to remain unfavourable until at least 2015 (see Figure 1). The main negative contributions come from the primary deficit (12.6% of GDP on the debt ratio in 2011-14), which might take until 2015 to return to surplus from around -9% in 2010 and an unfavourable interest rate growth differential (contributing around 7% of GDP). show the challenge ahead: under our baseline scenario if Ireland returns to its 2011 debt to GDP of 113% by 2020 it would have to run primary surpluses of at least 3% of GDP after 2015.